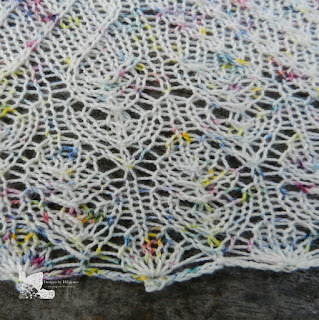 I'm so happy to share with you my first triangle shawl pattern. A lot of love has gone into this pattern and project. For Christmas this year I received Knitpicks Hawthorne speckled yarn pack from my MIL and FIL. It came with 4 skeins of the speckled yarn. I wanted to design something simple that would complement the yarn. One of the favorite things my MIL says when she gets too hot is "I'm just over here creating my own sunshine." So this shawlette is named after her. This shawlette is perfect for that transition into spring. It is light and airy with great drape created by using needles that are a bit bigger than what is recommended for this yarn. It fits just right around your neck for a nice statement piece. It would be easy to adapt the pattern for a larger size if you would like. One of the pattern testers did just that, so be sure to checkout her project page on Ravelry if you want to make yours larger. The pattern is simplified with those right and left stitches that I love so much. The body transitions into a beautiful lace pattern that has the look of feathers or blooms coming off of their stems. Also I love the little heart created in the middle of each side. Where Can You Get This Pattern? The question you have all been asking. This is a pattern that will only be available through my Ravelry Pattern Store. It is on sale for $3.00. With this pattern you will get the written instructions, explanation of stitches, and the chart. If you use the coupon code NEWPATTERN, you can get $2.00 off the pattern. This code is good until the 19th of March. This pattern has been tested by pattern testers through the free pattern testers raverly group. If you want to read through the feed for it you can here. My testers were great and they have project pages for their finished shawlettes that you might find helpful as I mentioned above. What Will You Need For This Pattern? Yarn: knit picks Hawthorne Specked color confetti 357 yards 100g. Gauge: 16 k, and 28 rows after blocking equals 4 inches. K: knit, p: purl, yo: yarn over, RT: Right twist, LT: Left twist, s1pw: slip 1 stitch purl wise, k2tog: knit 2 stitches together, psso: pass slipped stitch over, ssk: slip, slip knit 2 together, pm: place marker, sm: slip marker, crocheted bind off (explained at end of pattern).